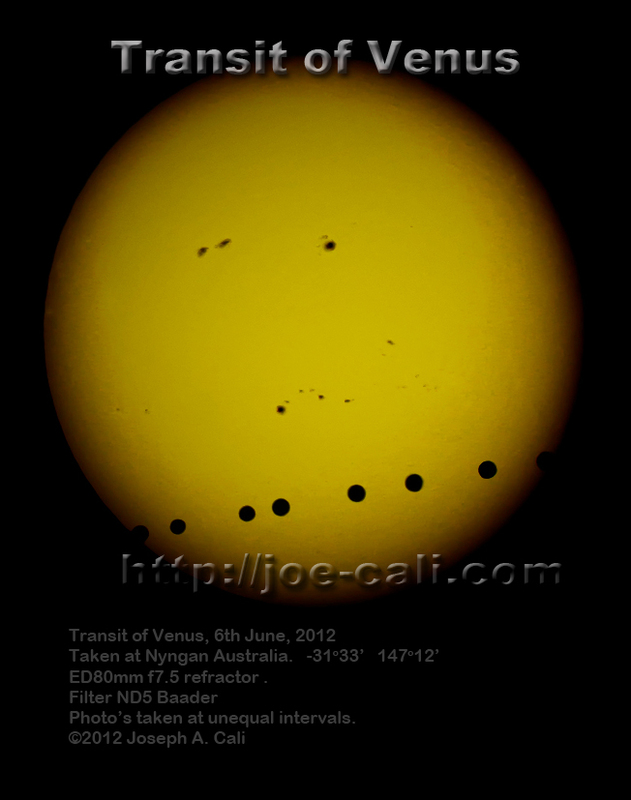 Transit of Venus - curved path observed? 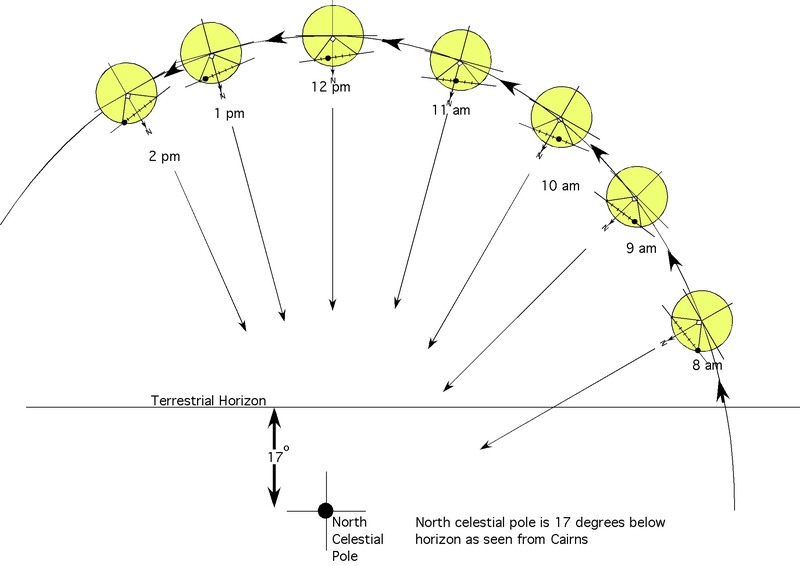 Explaining the strange curved paths followed by Venus during the 2012 transit. I've had numerous questions about the strange curved trajectory the Venus took across the Sun's disk. along almost the same path. It was in fact even closer to a straight line than in my illustration below. 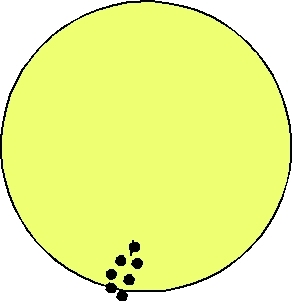 of the Sun as observed from earth, as most of the pictures on the internet show. counter clockwise. What we saw was a little different, and more like this…. although for us perhaps a little less movement to the left than in the picture? Let's split the problem into two parts and then deal with each in isolation. 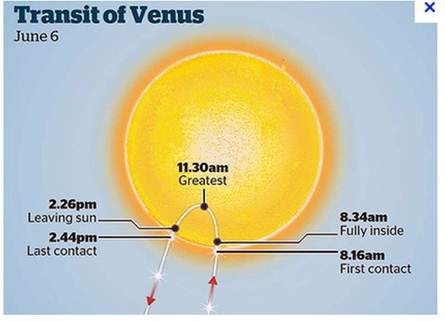 Don’t think left to right but rather that Venus was moving from east to west. Pictures on the internet and on TV are usually generated using a geocentric perspective. That is the view from the centre of the Earth, north up. This coincidentally is the same as the view from the northern hemisphere when looking at the Sun in the south. in astronomy, we are looking up! If you have trouble with this, lay on your back, head to the north feet south looking up. East is to your left, west to your right. Now roll over and face down as in a map view. The directions are reversed. If you are standing anywhere on the southern hemisphere looking north, you effectively are standing upside down relative to the geocentric or northern hemisphere frame of reference. 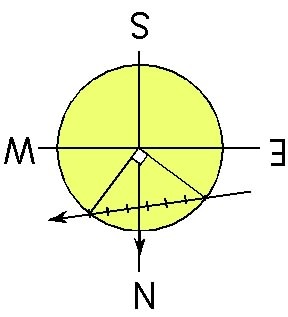 Around midday when the sun crosses the meridian, the north pole of the Sun points down to the north celestial pole some 17o below due north on the horizon when viewed at Cairns latitude. Now the apparent direction of motion is right to left relative to the Sun’s orientation at midday. subtended 100o. 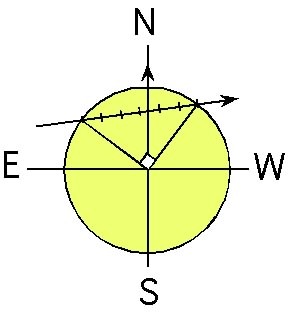 For simplicity of illustration, I have used a right angle in the representation below. always appears to be at about "6 o'clock" with respect to the horizon regardless of the progress of the transit. and out along the same path. the Earth's axis of rotation. They are driven with a motor to rotate at 15o per hour to effectively cancel out the Earth's rotation in one movement. You can see that when the Earth's rotation is removed the planet has transited along a straight chord. This flash slide show shows some of the weird paths that the transit took as seen from different parts of the Earth.